The fifth edition of the Bridge Cape Pioneer Trek international mountain bike stage race has attracted some of the biggest names in the world of women’s marathon mountain bike racing; and looks set to become the most competitive edition of the South African stage race yet. In addition to the event’s attractive route, which has evolved from a brutal survival test into a well-rounded, stimulating race route, a R30 000 total prizemoney boost from new sponsor, Khombisa Media, to the women’s category, has led to a notable increase in the depth and strength of this division. Confirmed to start the prestigious race on 20 October 2013 are the following pairings: Annika Langvad (DEN) and Ariane Kleinhans (SUI), Esther Suss (SUI) and Jane Nuessli (GBR); and top South African pairings Ischen Stopforth and Robyn de Groot and Yolandi de Villiers and Yolande Speedy. Langvad is the current Danish XCO champion and is a double marathon world champion, having claimed the prestigious title in 2011 and 2012. Her partnership with Kleinhans is expected to be a formidable one, based on their combined pedigree. Kleinhans is the current Swiss marathon champion and is a multiple winner of the ABSA Cape Epic Mixed title with her South African husband, Erik. Langvad and Kleinhans, who will race as Team RE:CM DaVinci at the Cape Pioneer Trek, were fourth and seventh respectively at the 2013 Marathon World Championships in Austria in June. “I met Annika at the marathon world championships in Austria this year. After seeing the strong women’s field for the Cape Pioneer Trek I knew I needed a powerful partner, so I asked if she’d be keen and she agreed,” explained Kleinhans. “Annika did a stage race in Andalusia in Spain this year, but the Cape Pioneer Trek will be her first stage race in South Africa. She is an incredibly strong rider. I will have my hands full trying to stay with her, but I think we will make a good team on and off the bike,” added Kleinhans. 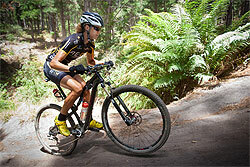 “I am super excited about the competition in the women’s race at this year’s Cape Pioneer Trek! It’s good to see the sport is growing and the event is gaining more depth. This will be my last big goal race of this year and I am looking forward to giving of my best there,” said Kleinhans, who has been training and racing in Europe for the past three months. Nuessli, the 2012 British Marathon champion, will team up with Swiss legend, Suss in what should also be a formidable pairing. For Nuessli, who plans to retire from racing at the end of the year, the 2013 Bridge Cape Pioneer Trek will be her final major stage race as a professional racer. Thirty-nine-year-old Suss won the bronze medal in the Elite women’s World Championships XCO race in Pietermaritzburg at the weekend and is a five-time Marathon World Championships medallist, claiming the gold in 2010. She is also a multiple Cape Epic title winner, in the Women’s and Mixed categories and is currently ranked seventh in the UCI world rankings for 2013. Stopforth is a former winner at the Cape Pioneer Trek, having secured the overall title in 2011 with Catherine Williamson. The pair were runners-up last year. Stopforth won the 2013 Old Mutual joBerg2c with De Villiers. Stopforth’s new Cape Pioneer Trek partner, De Groot is a 2012 road race Olympian and the current South African marathon champion. De Villiers and Speedy are the defending women’s champions. De Villiers hails from Oudtshoorn, the hometown of the Cape Pioneer Trek and has a strong stage-racing pedigree, with a number of podium places in the Cape Pioneer Trek and Cape Epic stage races over the years and victory in the 2013 joBerg2c with Stopforth. 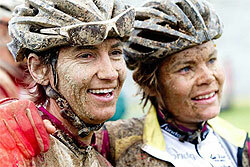 Speedy is a former XCO Olympian, a two-time Cape Epic Mixed category winner and the current Women’s Cape Epic champion. 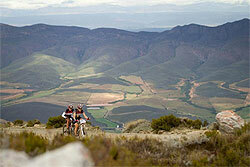 The Bridge Cape Pioneer Trek is a seven-day stage race in South Africa’s Western Cape province from 20-26 October. It covers a total distance of 549 kilometres with a total of 11 657 metres of vertical ascent. There are limited entries still available with the cut-off on 15 September.